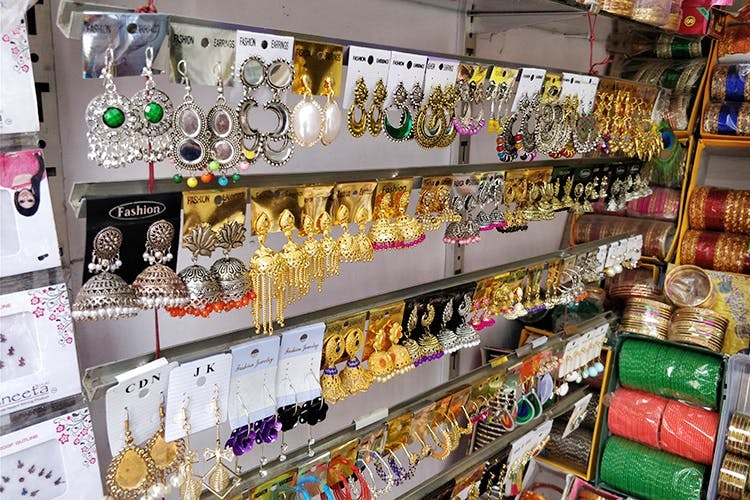 We found these stores lined up at North Mada Street, Mylapore which have some of the latest fads in earrings and jhumkas starting INR 20. If you’re a good haggler, you can get these cute delights for even less! All these stores are located at one stretch starting opposite Sukra Jewellery until Lakshmi Vilas Bank. This store is opposite Sukra Jewellery and they have jhumkas of all sizes starting INR 20. These cute silver Om jhumkas were our favourite! Love the intricate, long jhumkas? Check out this store, they have ear rings in a wide range of colours starting INR 30. This shade of azure caught our eye. The ear rings at this store have a very South-Indian touch to them. Most of their jhumkas are traditional and come either in gold or silver coating. We found these pair of golden jhumkas gorgeous. This store has some fresh designs that can be paired along with almost anything. They have earrings made of beads, feathers, shells, and more starting INR 30. Pretty pink jhumkas is our pick! If you’re the kind that likes small danglers, this store is for you. They have earrings of small sizes of a wide colour spectrum. These simple but elegant multi-coloured options can go with almost anything.